One of the stunning Sunrise views at Mumbai is at the Sewri jetty on a high tide early mornings. Mumbai being on the west coast of India, it is indeed a pleasant experience to watch the sunrise moments at the Sewri jetty, particularly matching with the high tide. Recently we were in Mumbai and visited Sewri Mumbai at sunrise hoping to find Flamingos which flock the area during the winters. It was high tide and we were more than happy to watch a lovely sunrise at Sewri. You can explore a beautiful Sunrise scene at Sewri Jetty. The historical Sewri fort very close by, say 5 minutes walking distance from the jetty. The visual impact of high tide & low tide, of course, you need to plan a visit separately. You can spot several birds if you are a birding enthusiasts. Migratory bird Flamingos, particularly colonies of Lesser Flamingos during the winter months of November to January. The Flamingos can be spotted in thousands during low tide. Carry a binocular for the best view of Flamingo colonies. The Sunrise at Sewri, Mumbai is best viewed from the jetty unless you live in a highrise building nearby. The Sewri jetty is a mere 10 minutes walk from the Sewri station on the harbor railway line of Mumbai local railways. Recommend you be in a small group to avoid any unpleasant situations prior to the sunrise in an unfamiliar area. Watching the sunrise scene at Sewri is surely a very pleasant experience. The golden rays of Sun, their reflections in the water particularly during high tide, is a bliss to watch, what a dramatic change in the day & life. 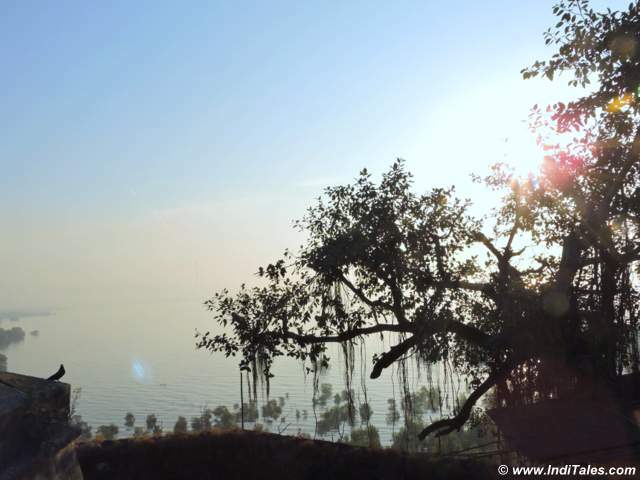 Whether you are an early riser Mumbaikar or a late one, visit sunrise scene sometimes, you will love it. Sewri fort is a historical fort of Mumbai. Probably built to defend any attacks from sea and to facilitate trade. It is a small fort. The maintenance of the fort is ok. Not many tourists or visitors were there. Bird lovers can find a variety of birds at Sewri jetty and around. We saw Brown-headed Gull, Whiskered Tern, Grey Heron, Great Egret, Western Reef Egret, Parakeet, Brahminy Kite, Black Kite, Common Kingfisher, White-throated Kingfisher, Golden Oriole, Coppersmith Barbet and more. You may find more if interested in birding. Another interesting feature to observe at Sewri Jetty is high tide & low tide. While Sunrise scene is at its best during high tide due the golden color reflections in the water. The low tide scene helps one to understand how vast amount of water recedes at a fast pace over 4-5 hours of time. Thus exposing the seabed & underwater marine life as nutritious food to a variety of birds. 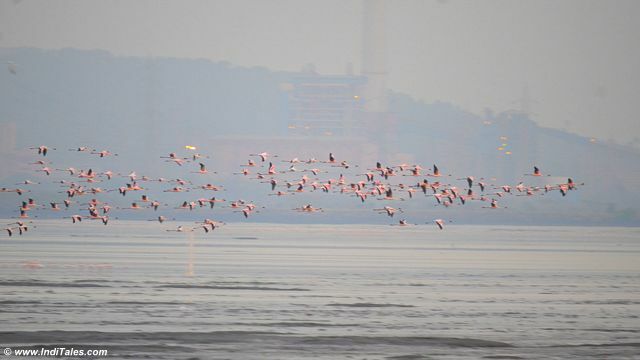 Huge colonies comprising of thousands of Lesser Flamingos migrate to Sewri and nearby sea shore of Mumbai during the winter. The Lesser Flamingos though seen in large numbers here, they are considered near-threatened species. Due to declining population and the low number of breeding sites, due to human activities. Lesser Flamingos measure about 3 ft in height, have a deep-keeled bill. Larger black tip of bill distinguishes them from the greater flamingos. Algae is their primary food. The shape of the bill helps them feed the tiny algae in the residual marine waters of the receding sea during low tide. The light pink color of the birds is attributed to their diet. 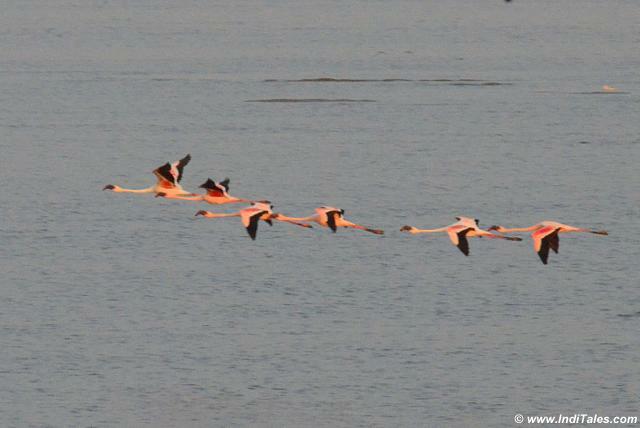 The colonies of lesser flamingos could be seen flying across to choose the better spot to feed as the sea was receding. You can see the barges, oil storage facilities, evening lights etc in the background. Several smaller groups of Lesser Flamingos too can be seen flying around here. The light was not right for photography. The birds were too far. For Flamingo photography be there an hour before low tides of the day timings. These images were captured in the evening near sunset time. The Megapolis Mumbai has over the past century transformed itself from a fishermen colony & people dependent on the sea to the financial capital of India. The highrise buildings can be seen from the jetty. One should be able to see the beautiful sunrise from these high-rise buildings as well. Overall it was a nice visit. Recommend you to explore Sewri Mumbai sometimes. Recommend you read following places to visit in Mumbai, attractions for the visitors. Iconic CST Mumbai – the nuances you do not know. Dr. Bhau Daji Lad Museum – celebrating the city of Mumbai. Exploring the Street Art in Bandra, Mumbai cityscape. Banganga Tank – the Ancient heritage of Mumbai city. Global Vipassana Pagoda or the Golden Pagoda, Mumbai. And by the way, looking at the flight patterns of those amazing flamingos in your picture, I think theirs would be similar to that of yet another migratory birds black-necked cranes seen in my country Bhutan during winter. I am curious! Sherab, The Sunrise & Sunset scenes over seascape are incredible to watch for fast changing colors and reflections. Watch them sometimes. I have not yet seen the black-necked Cranes although I visited Bhutan long time ago, they too would be interesting to watch. nature`s beauty in urban mumbai ! ? a new twist of thinking at its best description. brings 2 my mind the sunset point in nakki lake in mount abu, rajasthan. such points on the chandipur sea coast and beaches, odisha launch pads r also a beauty 2 watch. goa beaches al2gether a diffferent wonder. Now that you know, please do visit, especially if you are there in winters. Yogi, I am surprised that so many people do not know about this. I thought Sewri and Flamingos are quite popular in Mumbai. Happy that some people are finding this new information about Mumbai. Thanks, Shesha. Glad that you discovered a new place to visit through IndiTales. May you get to see Sewri soon enough. Stay Connected. I am born and brought up in Mumbai. But sorry to say never got a chance to see Flemingos in Mumbai. I am proud of my birthplace . I am happy to see the beautiful pictures you have posted . Thank you , Anuratha. Thank you, Shobha. Please do visit Sewri & see flamingos for yourself. I have not visited Mumbai yet. But it’s a pleasure to know about this beautiful place.Thank u mam. Neha, I hope you get to travel to Mumbai soon enough. I would look forward to hearing your Mumbai stories. 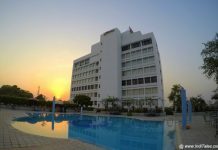 These days, even at the end of April (2017) as I write this comment, we can see thousands of our Siberian beautiful guests at Navi Mumbai … and that too just off the Palm Beach Road. That is good news Kaunteya. The pictures speak a million words! I think I need to visit Mumbai with Sewri Jetty in mind! The flamingoes are beautiful! You should visit Sewri Jetty. Thanks for sharing this information Anu. Kratika – Happy that you found the IndiTales post on Mumbai useful. Have a great trip.